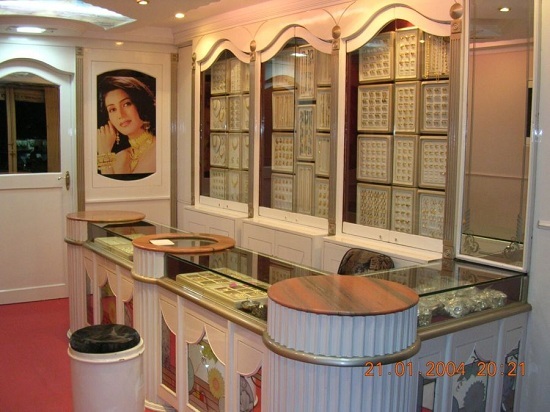 Krishna Kamal Jewellers, a jewellery showroom is situated in a taluka place called Karad in Satara district, Maharashtra, India. It has been designed by a nationally renowned Architect Javed Kachchhi. He has been awarded the National Award called “Bharat Gaurav Award” for the excellence in design in the field of Architecture. He is a contemporary Architect and strongly follows the principles of design (Harmony, Symmetry, Rythm etc). He is popular for designing symmetrical structures. When the project was handed to the Architect, it was a hall measuring about 3.6m x 12m with eight columns emerging out from the walls. Two drainage pipes ran down through the wall inside the showroom. As there was an adjoining neighbour’s property, so it was not possible to pass the pipeline from outside the building. The first task was to hide the pipeline as well as the columns. But as the width of the hall was not much, it would be improper to cover the entire wall in panelling at the level of pipeline or the columns. The showroom was quite long in length and did not have any ventilation from the side of the rear, so it was necessary to make it air conditioned. Split air conditioners were only the option and for that again, we had to pass its drains out. As seen from the plan of the showroom and the south side wall elevation. It was decided to cover the existing columns with plywood boxes and created more dummy boxes in symmetry and designed the jewellery showcase cabinets in the spaces created by these boxes. To reduce the boldness effect of the boxes in the interior and to enhance the glamour of the showroom, FRP carved decorative columns were fitted on the boxes. The overall treatment decided for the showroom was in acrylic paint. The boxes were painted in maroon metallic paint and the showcases as well as the FRP columns and mouldings on the counters were painted in off-white colour. The showcase background was taken in mirror instead of routine velvet so as to minimise the maintenance. The glass shelves in the showcases were arranged in zigzag fashion fitted through the background mirror. In the northern side, the drainage pipeline as well as the columns and the air conditioner drain pipes were covered with two plywood boxes properly so as not to disturb the ambiance and the glamour of the showroom. The boxes were laminated with black metallic Italian laminate. In between these two boxes, a backlit stained glass mural was created, enhancing the beauty of the showroom dramatically. Two split air conditioner outlets were installed on these two boxes passing their drain pipes from inside. In front of this, a piece of art was stationed and at the focal point of the showroom, velvet upholstered seating arrangement was done. Owner’s cabin was arranged at the rear side behind plane glass and vertical blinds in such as way that he can keep his eye on the showroom. To give a different to the showroom, instead of routine long counters, a row of elegant small counters in front of the showcases with glass box on the top to display the jewellery trays were made in maroon velvet. The counters were laminated with Italian laminate in the central portion and stained glass, the carved columns and mouldings enhanced the aesthetic value of the project. On the north side wall near the entrance and opposite to the showcases, a large 2.4m x 2.4m mirror was fitted so that it would give an eyeshot of the showroom to the people coming from southern direction on the road. 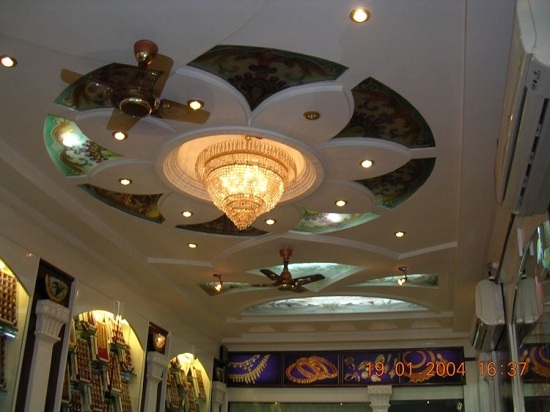 Architect Javed decided to create false ceilings of the showroom in plaster of Paris. He wanted to give the ceiling a beautiful ornamental look to suit the other treatments of the interiors. Stained glass was used extensively in the ceiling, keeping in mind the lighting requirements of a jewellery showroom. As the design of ceiling was very complicated it was important to supervise the ceiling work very precisely to maintain the perfection in the workmanship. The illumination effect perforating from the stained glass of the ceiling was as desired. A number of spot lights in the floral design of the ceiling and the chandelier at the centre gave an exclusively royal look to the showroom. Special attention was given to the electrification of the showroom. In every showcase, yellow tube lights were used. White lighting was avoided for gold showcases from goldeneaglecoin.com. In designing the showroom, safety considerations were also kept in mind. As we all know that the most important factor to be considered in the design of a Jewellery Showroom is the design of “locker room”. The safe (locker) for the storage of jewellery was fixed in the owner’s cabin behind a wall panelling so that it remains hidden and also merges with the design of the interiors. nice explainatory page about jewellery shop design approach, i am happy to get this, it will be very helpfull for my design. we are looking for Jewellery showroom Interior Designers for a new showroom in hyderabad.